Cirque Eloize’s latest adventure is inspired by the rich legacy of the Wild Wild West. America is expanding. The railroad is stretching westward to lands of untold promise. In the middle of the desert, a town comes to life. The Saloon doors swing open to reveal a motley cast of individuals, each with a tale to tell. 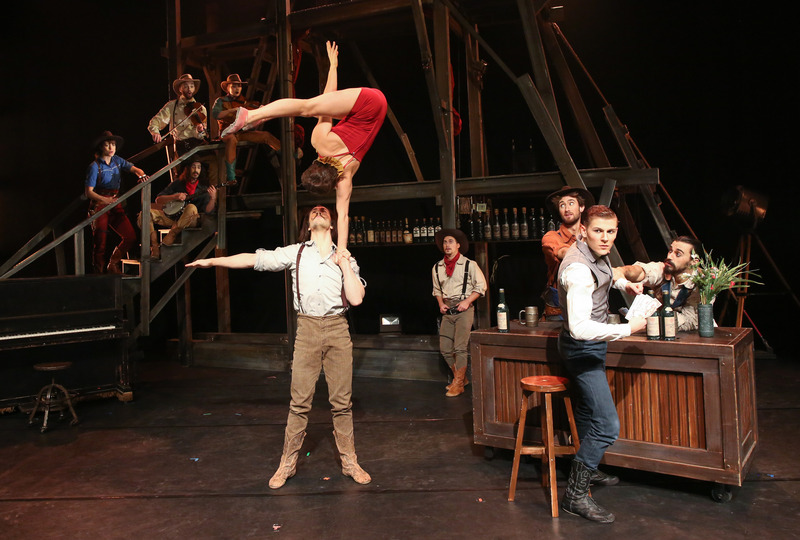 In Cirque Eloize’s Saloon, the infectious energy of folk music and the strains of a fiddle set the tone of an acrobatic comedy that sweeps spectators away in a mad flurry. Under the spell of Saloon’s beautiful Belle, the lover sets off a chase worthy of the greatest Westerns. A series of unusual events unfold, mixing acrobatic prowess and inventive choreography. Swing open the Saloon doors and enter a mythical world created by live music and the exhilarating pace of spectacular performances. Let yourself get swept away by enthralling voices, magical harmonies and live instrumentation. The timeless tunes of Johnny Cash and Patsy Cline set the traditional, epic scene for a fast-paced show with no shortage of audience thrills.